Balance! I imagine my two big passions in my life as a seesaw. Running on one side and teaching on the other. Sometimes the running side weighs a bit more heavily, for example when I’m training for a race, and sometimes the teaching side weighs a bit more, especially when I have a lot of school events going on in addition to teaching, like book clubs, night events, Regional PD planning. I always feel like if i stopped running the whole seesaw would just TIP OVER! Or if I wasn't really pursuing teaching voraciously the part of my brain that loves challenges and creativity would rebel. Is it REALLY hard sometimes? Yes. Sometimes I DON’T want to run 7 miles after a long day at work. Get home at 6 then go run? Hmmm no. And sometimes after a hard workout in the morning when I have a hard day ahead I dream of school magically being canceled. But that doesn’t happen THAT often. And when it does, it usually happens when I’m not planning my training strategically enough or when I am overworking myself at school and being a perfectionist. Running helps rein in that perfectionist side because I can’t keep perfecting this worksheet. I need to just print and photocopy it because I need to go running and this is good enough for right now. Passion! My passion for running feeds into my passion for teaching. I LOVE running. I love my own running, I love training plans, I love my Believe I Am training journal, I love being a part of my local running community, I love my Oiselle running community, I love races, I love all the adrenaline. When I crush a hard workout in the morning, it fuels my confidence and motivates me. If I already ran 8 miles with speed work, I go into the day with this awesome frame of mind and I end up motivated to rock the rest of the day as a teacher. Organization and Focus. Through running, I have developed organization skills - mapping out my training for the week ahead and planning for races (I love my Believe Journal for organizing my running - let's just say its the Erin Condren of running planners!). I also learned other skills like perseverance, hard work and grit that have transferred over to teaching. And on a day to day basis, balancing running with teaching necessitates being organized with teaching or else I wouldn't be able to do both! I can’t diddle daddle on my lesson planning or waste time at work participating in drama or postpone tasks. I know I have to go into each day with a specific To Do List and be DONE with my To Do List the end of day or else my running suffers. 3D Teacher. I become more three dimensional for my students when I have interests outside of school. My students will mention that they saw me running around town. I’ve run races with my students. I’ve coached the older siblings of my students. All these things build stronger relationships outside of the classroom. Mental Health. Being a Teacher Runner helps me handle disappointments better because it’s not my only passion. If something goes bad at school or not as well as I hoped, I use that to fuel my workout later in the day. If my training for the day is horrible, it’s okay, because I still have teaching. We all have off days as athletes and moving on to teaching helps me get over a disappointing run. And we all have bad days as teachers. Letting your mind linger on a bad workout or a bad teaching day makes it SO MUCH WORSE. Having two pretty demanding passions actually makes each one easier because it gives me immediate perspective that there is more to my life and more to me as a person. The ONE bad thing about being a Teacher Runner? Balancing the need to drink enough water with the opportunity for going to the bathroom! You can’t go running dehydrated but you know there are also very small bathroom opportunities during the day! 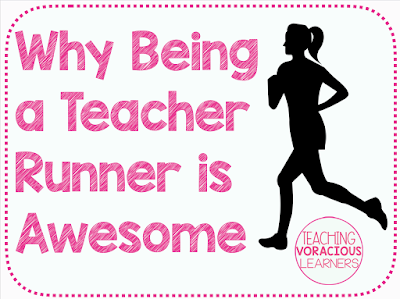 Are you a Teacher Runner? I'd love to know!